Republicans have nominated Donald Trump as their presidential candidate. Blocks away, police took on groups of demonstrators protesting the billionaire’s statements on race, the environment and gender equality. Despite some delegates’ voicing dislike for Donald Trump, Republicans were all but assured to choose him to lead the party’s charge against the Democrat Hillary Clinton over the next 110 days until the November poll. It ended an insurrection by Trump’s opponents within the party, who had staged a failed attempt to force a vote opposing his candidacy on Monday. Trump trails former Secretary of State Clinton in many opinion polls after he inflicted nearly as much damage on himself as on his more than 16 Republican opponents – many of whom boast more impressive electoral resumes than he does – in the scorched-earth 2016 primary campaign. Still, the lead of the former first lady and New York senator has slipped to seven points, according to a Reuters/Ipsos poll released late Tuesday. 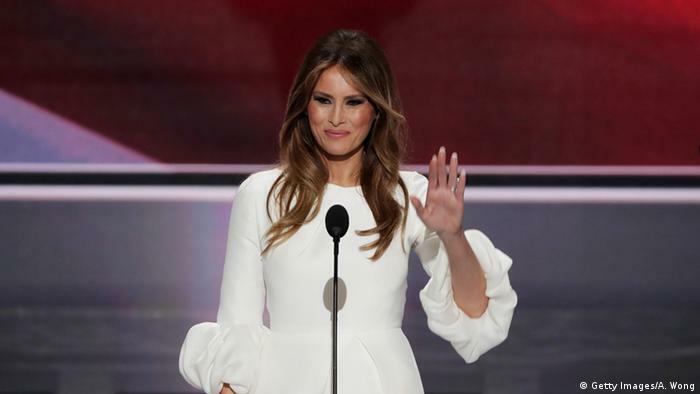 Accusations of plagiarism continue to dog Melania Trump. Her endorsement of her husband on Monday appeared to repeat word-for-word statements made by current first lady Michella Obama when her husband, Barack, awaited the Democratic nomination at the party’s 2008 convention. As critics accused Trump of lifting passages from Obama’s speech, a campaign official suggested that the similarity had resulted from an error by the potential first lady’s speechwriters. If that proved the case, Republican National Committee Chairman Reince Priebus said, he would probably fire the writer. Trump made an impassioned plea that, the transcripts show, many had heard before. Late Tuesday outside the Quicken Loans Arena – which takes its name from a high-interest short-term cash advance service that targets low-income customers – demonstrators appeared outnumbered by police and members of the media. Police on bike and on foot formed lines to keep pockets of competing protesters separated. Officers on bicycles formed a line between a right-wing religious group and left-leaning protesters carrying a sign that read “America Was Never Great” – a reference to Trump’s repeated pledge to “make America great again.” In order to do so, Trump has endorsed a temporary ban on immigration from primarily Islamic countries and the building of a wall on the US’s border with Mexico.